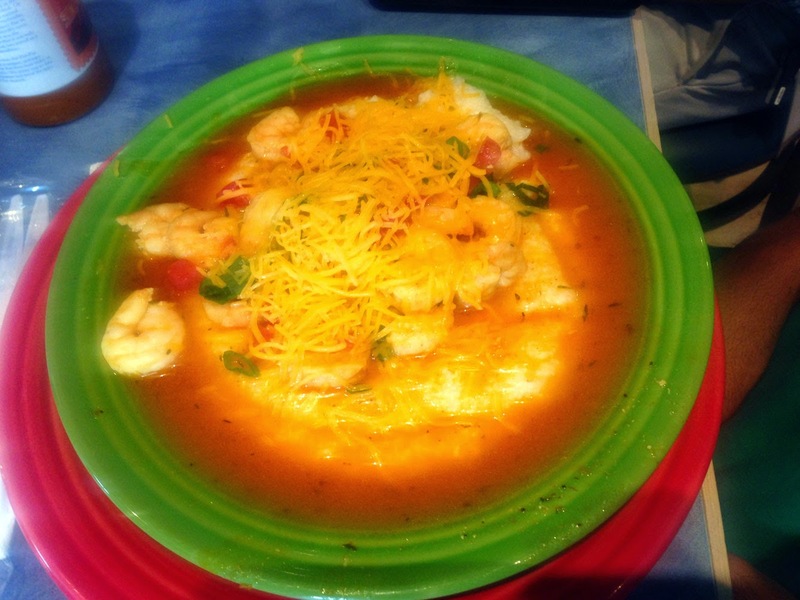 Boneheads Seafood is located at 4511 Olde Perimeter Way, Atlanta GA 30346 in the shopping center that's anchored by Target but that also contains many other restaurants like Outback Steaks, Taco Mac and the great new Your Pie pizza joint. There used to be quite a few locations but many seem to have closed or been replaced by Fishbone (not sure if they're related but they seem very similar). The restaurant is located on the right of rows of buildings to either side (rather Death Star Trench style) when you pull-in from Perimeter Center West. 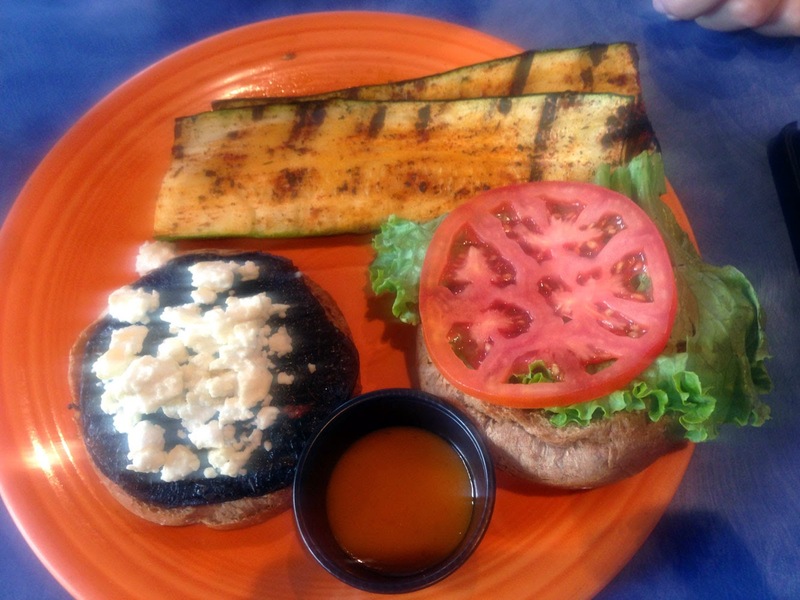 While Boneheads may not appeal to everyone, I've had many good meals here (it's within walking distance from my old office) - I think of it a s a step-up from fast food. You order at the counter and the food is brought to the table. 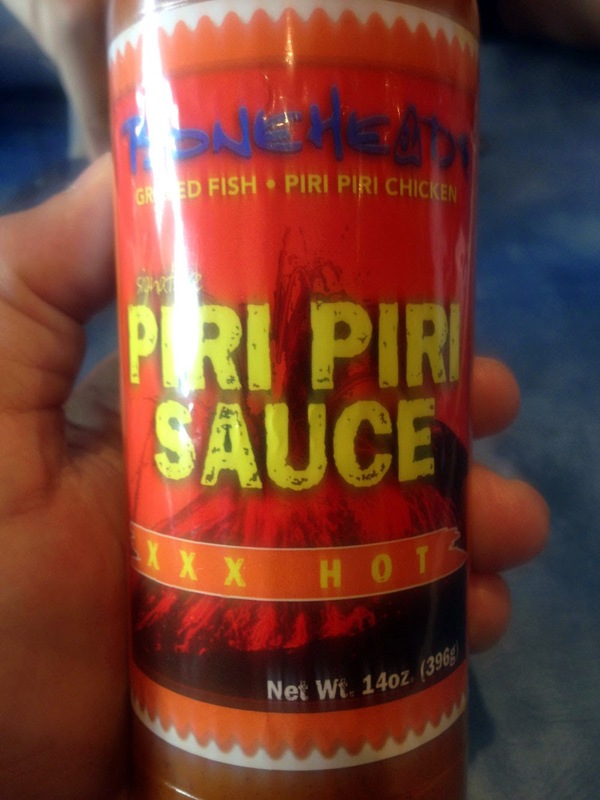 Make sure you grab a bottle of the extra spicy piri piri sauce. 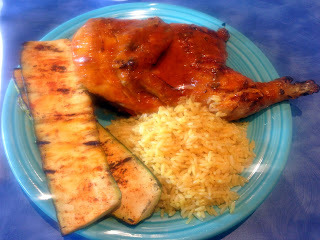 Generally I either get the half-chicken or a piece of fish, with the grilled zucchini side. 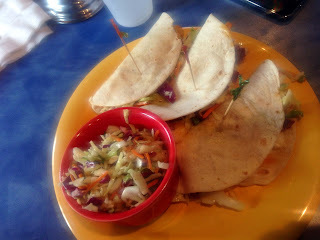 I've tried both the fish tacos (tasty!) and the shrimp-and-grits and have liked them both. I've also ordered take-out from Boneheads and the food arrives relatively hot, fresh and quickly. I think they do a good job on the grilled fish - the chicken has been slightly inconsistent, sometimes over/under-done but still very passable. I usually pull off the skin then add more piri piri - love the flavors in that stuff. I pass on most of the sides (have had the salad, the Asian slaw and a citrus salsa - all were passable but be careful of the cilantro if that's not your flavor). Oh and the rice of course - it's pretty good. I think they do the best job on the salmon and tuna - haven't had very good luck on the mahi (tends to be dry). Also, the portabella mushroom sandwich was tasty if you're looking for a veggie option. 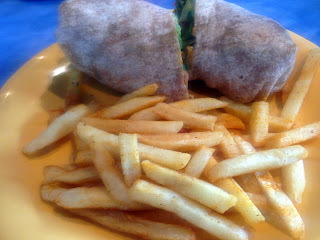 Or they have a veggie wrap that my veggie friend Sid thinks is pretty good. About Piri Piri seasoning - this is on the spicy side with distinct flavors of hot pepper (Scotch Bonnet or Habenero) and a bit of earthiness - the Extra Hot seems to be the real deal, while the others are pared down versions. 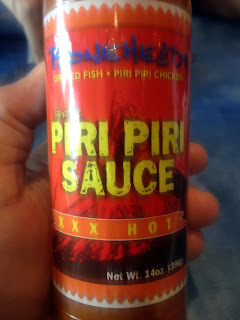 Even if you don't like it that hot try a bit of the extra hot - the overall flavors are just better. Since you order at the counter there isn't much to speak of regarding service - sometimes ordering takes a long time, sometimes it's fairly quick. They cook everything to order so when it's busy it may take a bit longer to get the food delivered to your table. The people here are very nice and they've been very accommodating when we've catered. Parking is off the "street" that flows between this large complex's buildings and can be a bit of a challenge. There are many spaces across the street and behind that building, in front of the bank - there's also a deck in the back corner near Outback Steakhouse if you don't mind walking. The rest of the restaurants in this complex are a bit iffy - nothing to write home about (with the exception of Flemings if you want to spend the bucks) but if you're nearby and need a bit at least there's some variety. My apologies on the crappy photos - I didn't realize a filter was turned on.